Down the street from Whirlpool's national headquarters is a half mile of undeveloped Lake Michigan beachfront surrounded by high dunes. 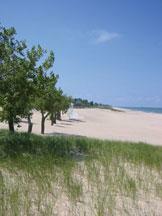 The beach is part of Jean Klock Park - 70 acres of lakeshore woods and wetlands donated to the city in 1917. It was a gift to the children of the future with the stipulation that it always remain a park. But city leaders here and economic developers like Wendy Dant Chesser say they have a better gift for the future children of Benton Harbor. Chesser is the president of Cornerstone Alliance, and her group works with Benton Harbor and Whirlpool executives to create jobs and tax revenue. "The plan is to utilize 22 acres of the 70 or so acres within the park for three holes at the golf course," says Chesser, "the green for hole number seven will be about three feet below the crest of the dune." Just picture it: a golf green on top of the sand dunes with a view of Lake Michigan, and then a tea box atop the next dune with the wind off the lake to help your drive. Who wouldn't pay big bucks to play on a course like that? Developers are spending millions to turn the vacant industrial sites and ground fields along the Pawpaw River in Benton Harbor into Harbor Shores. They say it would be a $500 million development with luxury homes, a hotel with a water park, a marina and the coup de gras - a Jack Nicklaus signature golf course. "And regardless of what you may have heard, this is not a golf course project. This instead is a community transformation project," says Chesser. But here's the thing: to make it work, developers say they need Jean Klock Park and its view of Lake Michigan, and many area residents say they like the park just the way it is. Developers call it an underutilized area and say the beach will be improved, but those who use it now say they love that it's not touristy or crowded for their picnics, weddings and even church baptisms. Carol Drake is the president of the Friends of Jean Klock Park and she's afraid that if the beach is part of a high-class resort, the city's poor residents will no longer come here. "If this happens it's going to basically put a wall between the residents and the lakefront because it's a new community of wealthy people," says Drake, "I mean, they're going to have to be to afford to buy these second homes." Similar Jack Nicklaus golf courses have green fees that are triple the daily average wage in Benton Harbor. But promoters say that's just the point: the resort will bring better jobs. An Upjohn Institute study predicts more than 900 construction jobs and 700 permanent jobs if the project is a success. State leaders are so excited by those figures that they've helped removed legal and regulatory barriers. Benton Harbor resident Marvin Heywood said most of those jobs would be seasonal and it's not worth losing the park just so he could be a caddy. "This is the illusion of inclusion as if they care about the city of Benton Harbor but who would just truly benefit? Not the residents of Benton Harbor because most of them won't be able to get a job that's paying $17 or 18 an hour," says Heywood. With the city and state so eager to see this project succeed, opponents hope the National Park Service will stop it. Michigan needs Park Service approval to develop the land and the Parks Service already denied permission once because the developers didn't bother to hold enough public hearings. The Park Service also said the replacement parks that developers are required to create were not good enough. The conversions were smaller parks scattered in and around the golf course as if families would stroll past holes 18 and 17 to picnic by hole 16. LuAnne Kozma is with the Defense of Place, a group dedicated to preserving park land. "We've uncovered a mountain of evidence that shows that the plan is essentially unapprovable," says Kozma. Developers disagree and are confident they'll get approval. Michigan Governor Jennifer Granholm and Congressman Fred Upton are both working on their behalf and construction has already begun on the 15 holes that are not in the park. In the end, there are simply two different visions of how the park can best be used. Defenders of the park say it's a beautiful resource to be preserved. Developers say their plans will make it even more beautiful and using it would give an economic boost to this hard-scrabble town. Attorneys will make their case before Michigan’s Supreme Court Friday over a disputed Jack Nicklaus-designed golf course in Benton Harbor. The course opened last summer. Nearly a century ago, the Jean Klock Park was donated to the city of Benton Harbor for public recreation. The city leased part of the 90-acre park to non-profit developer Harbor Shores Community Redevelop Corporation, who used land including sand dunes along the Lake Michigan shoreline for 3 holes of an 18 hole golf course. John Cameron represents the developers. Michigan’s Court of Appeals agreed with Cameron that designating part of it as a golf course is not against the restrictions. 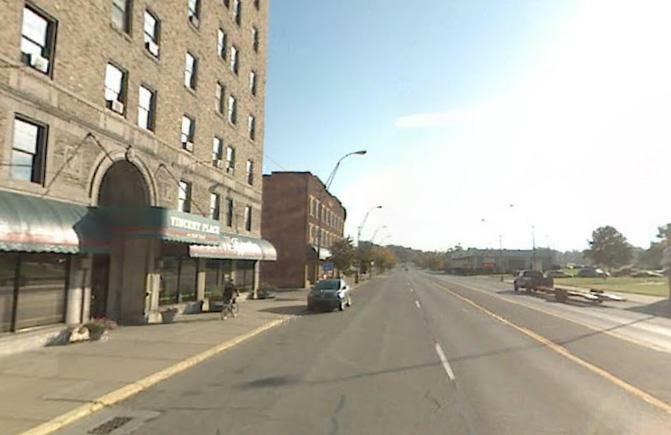 It also ruled that the city is allowed to lease the land. Joseph Harris, the state-appointed Emergency Financial Manager of Benton Harbor, has stripped control from city officials. It's the first time an emergency financial manager has used broad new powers granted to them by state legislators and Governor Rick Snyder. Harris issued an order "prohibiting all action by all city boards, commissions and authorities, except as authorized by the emergency manager." i) Call a meeting to order. ii) Approve of meeting minutes. 2. That all prior resolutions, or acts of any kind of the City in conflict herewith are and the same shall be, to the extent of such conflict, rescinded. 3. This order shall be effective immediately. Benton Harbor has struggled with a controversial trash hauling contract, lawsuits related to the contract, new competition for water services and city officials who sometimes clashed to the point that meetings dragged on for hours, Joseph said. "I have seen for more than 30 years the mismanagement of funds and personnel in the city," Joseph said. "Infighting has been going on for decades." It probably comes as no surprise that the relationship between Harris and government officials has been contentious. "Right now there's no cure for him, but I decree and declare that these city commissioners that we have now and with the citizens help we will find a cure. We will find a cure for this disease that we have here in the 49022 that's called Joe must go," said Seats. "It comes after the announcement of Robert Bobb in Detroit ordering layoff of every single public school teacher in the Detroit Public School system. With the stripping of all power of duly elected officials in Benton harbor and the attack on Detroit school teachers, we can now see the true nature of the Emergency Manager system."